Taos has a home! - Rocky Mountain Great Dane Rescue, Inc.
Taos has a home with his foster family in Elizabeth, CO. Taos is a very lucky guy. 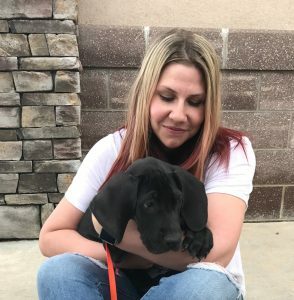 He has a full home who will give him lots of love….He has his new mom Sarah, her husband Jayar and their two kiddos as well as their Great Dane Newfie Mix “Charlie” to show him the ropes. Taos also has a cat to figure out which is going really well. The family lives in a rural area and loves to spend time outdoors. The family has affectionately renamed him Moose! Way to go handsome boy.